How many people here understand this picture? @Wamp, haha I didn't even notice it was spelled wrong. Maybe I don't even understand it..
@Korrafficorn, Ya, he's talking about that company that makes phones. He must be getting a phone call. @Korrafficorn, as a petrolhead i understand this meme. Looks like he just switched into maximum overdrive. @LindseyMoose, I told you you should have gotten the turbo. If he fart into the air intake valve, it'll give him a power boost just like NOS.....trust me I've tried it before. 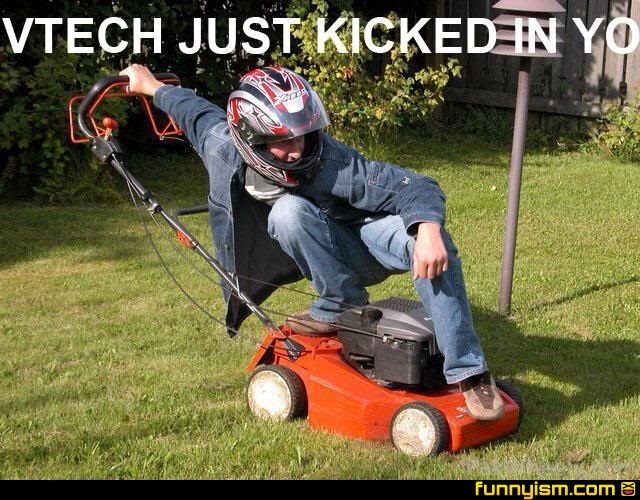 Pshh that lawn mower has WAY more torque than a Honda..
@chimp magnet, What if it was a honda lawn mower? @chimp magnet, hahaha how cute u can copy and paste a Wikipedia page. Your mommy must be so proud. @Toughbob Manpants, yea I love Hondas, but if you think about it, they make them "affordable" so everyone can buy them. They have the technology and power to make some incredible cars, but then they wouldn't be affordable anymore. I do wish they had a separate division for just pure performance, I mean Acura is coming out with a twin-turbo v6 TLX GT, so we'll see if that goes anywhere. @Civic Kid, numbers are what matters in discussions like these lol and I don't need Wikipedia, it's called being a car enthusiast, you know, what you're pretending to be. @chimp magnet, he's just a civic enthusiast. In other words, he's just not that smart. Or he's Spanish. Or both. But seriously Hondas are the most annoying cars because ppl try to make them look and sound like race cars but they end up sounding like go-karts. I've seen some nice looking ones and the Honda civic si coupe is pretty nice looking; it's a little quick because its light, but still has under 200 horses. I prefer to just take Honda for what it is and that is a reliable family car that novices will make ricer mods on then brag about it like it's the coolest thing until you smoke them off the line. With the right mods, any car can be fast but people with Hondas almost always seem to make the wrong ones. Sorry for the long post! Gasoline flavored gum sounds disgusting. @Cozmonic032, gasoline scented candles, on the other hand... I like the smell of gasoline. @Marten Reed, as do I! It's VTEC, Variable Timing Engine Control. Not VTECH...Variable Timing Engine Control Hi doesn't make sense. Lmao I own a 97 Honda accord 4 cylinder, this is fantastically funny!! Is that M13? From YouTube? My VTEC Honda is pretty awesome. I would rather have my old truck, but I still love my honda. It starts the first time, every time. @Cumslurper69, go off a ramp and cut grass THE RADICAL WAY!